Earth Day is a great time to reassess our impact on the environment and our commitment to protect the earth. We all can be a little more cognizant of our impact on, and appreciation for the Earth’s environment. The day also affords a time to reevaluate the hazards of extremism, the notion of taking noble concepts too far in implementation. This is where grassroots movements become scary and truly divisive. When they reach the “religious zeal” level, they can do much more damage than they do good. They are more divisive than they are inclusive. They become more confrontational and emotional than they are logical and principle oriented. They lose the moral clarity of their very existence and believe that their objectives of bringing awareness to their concerns justify whatever means they may implement to do so. The religious zeal of environmental “theology” has led to the proliferation of extremists groups firmly steeped in the Machiavellian idea that the ends justify the means. In 2005, the FBI stated that, “The No. 1 domestic terrorism threat [in the United States] is the eco-terrorism and animal-rights movement.” Groups such as Earth First, Greenpeace, Earth Liberation Front, and Animal Liberation Front are labeled as “eco-terrorists” by the FBI. Even the “Unabomber,” Theodore Kaczynski, was so classified since he was motivated by environmental concerns. These are extremists. Such groups and individuals have used arson, malicious destruction of property, bombing, and tree spiking to advance their causes. But rather than earning respect and support for their causes, they have alienated law-abiding mainstream society by their practices, and have even lost support among those who ideologically agree with them. This is much less likely for those who identify with the constitutional and moral imperatives of the Tea Party movement which grows numerically with every spending bill and legislative power grab out of Washington. This is a mainstream grass-roots movement comprised of members all across the political spectrum, except the far left. Our fears of government encroachment on individual liberty and exorbitant spending are empirically well founded, and the cause for dissent, which until now has been advocated and even praised by the left, is justified. The Tea Party movement should never advance to “extremist” status, which would only serve to justify the mainstream media and the administrations’ characterization of us and cause disillusionment and alienation from mainstream America. Some reports have surfaced that are intended to reflect badly on the movement. A few of those reports have been substantiated, but most have not. Some have actually been traced to infiltrators within the movement to intentionally sully and tarnish the cause. 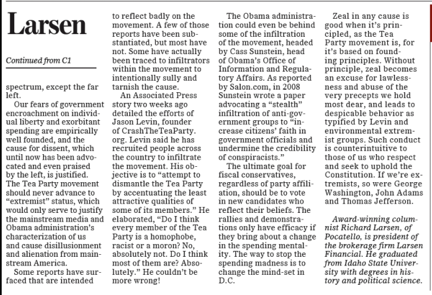 An Associated Press story two weeks ago detailed the efforts of Jason Levin, founder of the CrashTheTeaParty.org. Levin said he has recruited people across the country to infiltrate the movement. His objective is to “attempt to dismantle the Tea Party by accentuating the least attractive qualities of some of its members.” He elaborated, “Do I think every member of the tea party is a homophobe, racist or a moron? No, absolutely not. Do I think most of them are? Absolutely.” He couldn’t be more wrong! The Administration could even be behind some of the infiltration of the movement, headed by Cass Sunstein, head of Obama’s Office of Information and Regulatory Affairs. As reported by Salon.com, in 2008 Sunstein wrote a paper advocating a “stealth” infiltration of anti-government groups to “increase citizens’ faith in government officials and undermine the credibility of conspiracists.” Such a tactic would certainly be consistent with the “community organizing” mentality of the White House. The ultimate goal for fiscal conservatives, regardless of party affiliation, should be to vote in new candidates who reflect their beliefs. The rallies and demonstrations only have efficacy if they bring about a change in the spending mentality. The way to stop the spending madness is to change the mindset in D.C. Zeal in any cause is good when it’s principled, as the Tea Party movement is, for it’s based on founding principles. 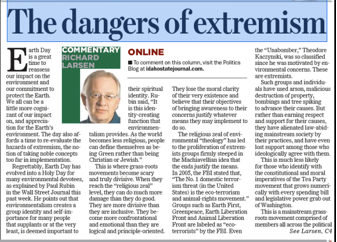 Without principle, zeal becomes an excuse for lawlessness and abuse of the very precepts we hold most dear, and leads to despicable behavior as typified by Levin and environmental extremist groups. Such conduct is counterintuitive to those of us who respect and seek to uphold the Constitution. If we’re extremists, so were George Washington, John Adams, and Thomas Jefferson.